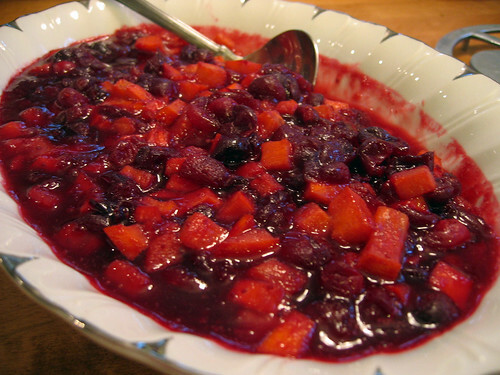 I have to be honest with you here: I used to really dislike cranberry sauce. Like yams with marshmallows, it was one of the few hallmarks of Thanksgiving that I never came to fully embrace. It probably didn’t help that the only cranberry sauce I’d ever tried was a gelatinous mass out of a can. Until last year. I grew up with dual cultural Thanksgivings: baghali polo instead of stuffing alongside the turkey, mashed potatoes and tahdeeg. What better way to make an Iranian-American enjoy cranberry sauce than to throw some persimmons in there? We love our persimmons and now, I love my cranberry sauce too. And since Thanksgiving isn’t too far off, I’ve started craving this (ridiculously easy) recipe again. I adapted it from an old issue of Gourmet to suit my own tastes: less sugar, more persimmons and cranberries, and cinnamon instead of star anise to modify the original recipe. 1. Bring cranberries, wine, water, cinnamon, 1/2 cup sugar, and a pinch of salt to a boil in a medium heavy saucepan, stirring occasionally, then reduce heat and simmer 5 minutes. Fold in persimmons. 2. Transfer to a bowl and serve at room temperature. Stir gently before serving. 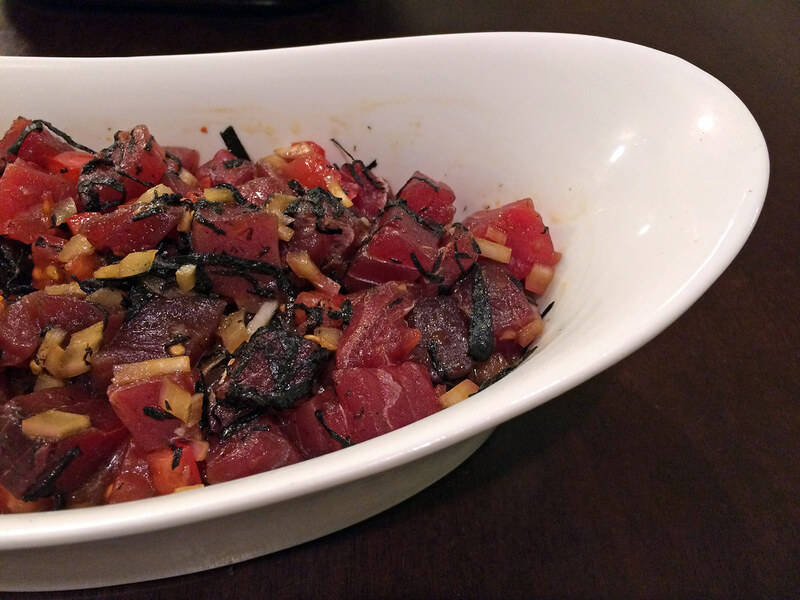 The first time I ever tried poke was, appropriately, in Hawaii. I was having dinner at Sam Choy’s Diamond Head restaurant in Honolulu a few years ago and the waiter brought around an amuse bouche of raw ahi tuna, tossed with flecks of onion, nori seaweed, edible flowers and the most magnificent sauce I’ve ever tasted. Ever since then I’ve been obsessed with recreating the dish. One of my go-to cookbooks is Martin Yan’s Chinatown, and coincidentally, it contains Yan’s adapted recipe for Choy’s tuna poke. I made this one day when I was feeling especially wistful for Oahu and you know what? I might not have to get on a plane again to taste that memorable poke. 1. Stir the soy sauce, vinegar, mirin, sesame oil and chili garlic sauce and cilantro together in a large bowl until blended. 2. Add the tuna, tomato, onion and seaweed to the bowl and toss until coated. Marinate for 5 to 10 minutes. Serve. Mussels are underrated. Cheaper than clams, but meatier and just as flavorful, they get a bad wrap. Sure, you probably shouldn’t order them in a restaurant (thanks to Kitchen Confidential, I’ll never look at a seafood special the same way again), but they couldn’t be any easier to make at home. For this dish, it’s essential that you use fresh mussels. Don’t bother with the frozen, pre-cooked variety, otherwise you’ll get none of that good briny flavor that you want to achieve. 1. Preheat oven to 450°F. Bring water with mussels to a boil in a large pot, covered, then boil, covered, shaking pot occasionally, until mussels open, about 4 minutes. Discard any unopened mussels. Transfer to a bowl with a slotted spoon, reserving cooking liquid, and cool to room temperature. 2. Put the half of the mussel shells with mussels attached in a large shallow baking pan (discard other halves) and drizzle with a little of the reserved cooking liquid. 3. 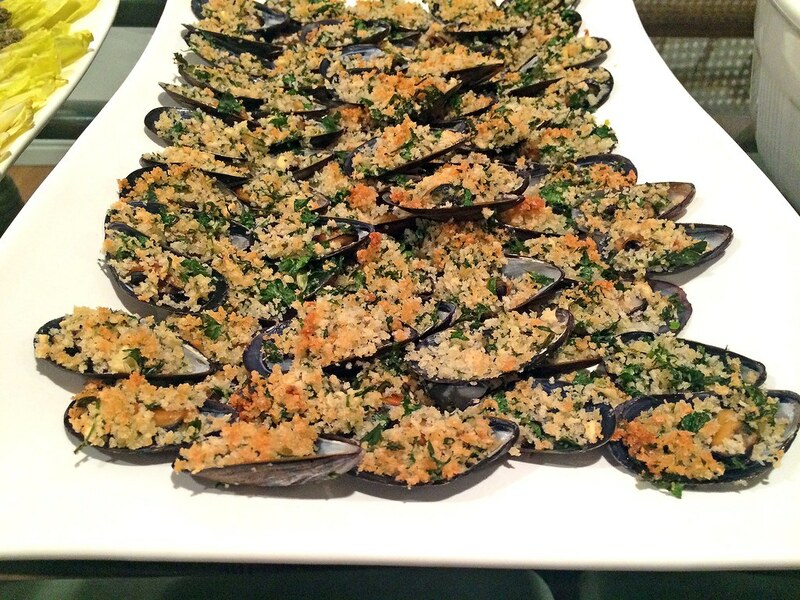 Stir together remaining ingredients, then top each mussel with about 1 teaspoon of mixture. Bake until crumbs are golden and crisp, about 5 minutes. I’ve been cooking with dried porcini mushrooms a lot lately. I used them liberally in two Thanksgiving dishes: baked pasta shells with cheese, porcini, pancetta and radicchio; and porcini-potato gratin. But we’ll get to those later. One of my favorite uses of this super-flavorful mushroom is in a pasta sauce, made even richer with the addition of creamy mascarpone cheese. Stirring in a classic tomato sauce at the end helps balance things out with a bit of acidity, making for a wholly satsifying dish. 1. In medium pot, gently saute the garlic with one tablespoon olive oil, and then add the chilli, oregano and tomatoes. Mix gently, taking care to not break up the tomatoes (this makes the sauce slightly bitter). 2. Bring to a boil and simmer gently for an hour. Add the vinegar, then stir and break up the tomatoes in the sauce with the back of a stirring spoon. Add basil, season well to taste, and add one tablespoon olive oil. Cover and set aside. 3. Place the dried porcini mushrooms in a small bowl and add 1 cup boiling water for 15 minutes. Meanwhile, heat the remaining olive oil and garlic in a medium pan and saute over low heat for 5 minutes. 4. Pick out the soaked porcini, reserving the porcini broth, and add porcini to the pan. Saute for 5 minutes. Pour in half a cup of the reserved porcini broth and discard the remainder. Simmer the mushroom mixture until the liquid is absorbed and then add the tomato sauce. Add the mascarpone and season to taste. 5. 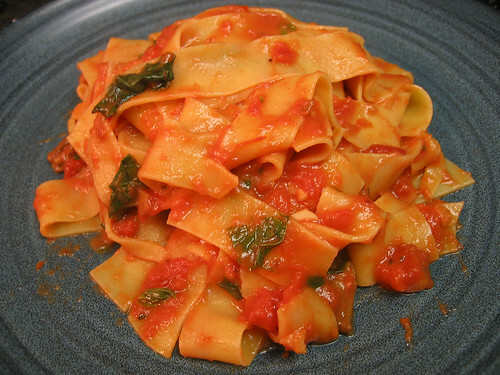 Meanwhile, cook the papardelle in salted wated until al dente and drain. Add pasta to sauce and toss. Serve warm. Lentils have always been a comfort food for me. Adas polo, an Iranian lentil and rice pilaf topped with fried onions, was a dish frequently requested by my sister and I when we were kids. Adasi, or soupy lentils served with olive oil and lemon juice and sprinkled with golpar, is one of my favorite meals when I’m feeling under the weather. A dish of lentil salad with browned sausages that I made recently is French-inspired rather than Iranian, but the comfort factor is still there. With the days getting shorter, darker and rainier, a bowl of well-seasoned lentils couldn’t be a better antidote to the autumn blues. 1. Heat one tablespoon olive oil in a saucepan over medium-high heat. Add the sausages and saute, turning ocassionally until browned, about 10 minutes. 2. In another saucepan, heat one tablespoon olive oil over medium-high heat. Add the onions and carrots and saute until the onions are translucent, about 4 minutes. Season with salt and remove from heat. 3. While the sausages cook, make the vinaigrette: In a bowl, whisk one tablespoon vinegar with the mustard and a pinch of salt. Whisk in two tablespoons olive oil. Season to taste with salt. 4. If lentils are not warm, reheat them. 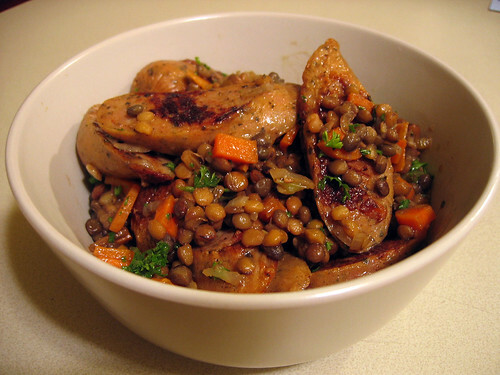 In a large bowl, toss the lentils with a little salt and remaining vinegar and olive oil. Drain the sausages and add sausages and vinaigrette to the lentils, tossing to coat. Stir in the parsley, onions and carrots and add salt and pepper to taste.